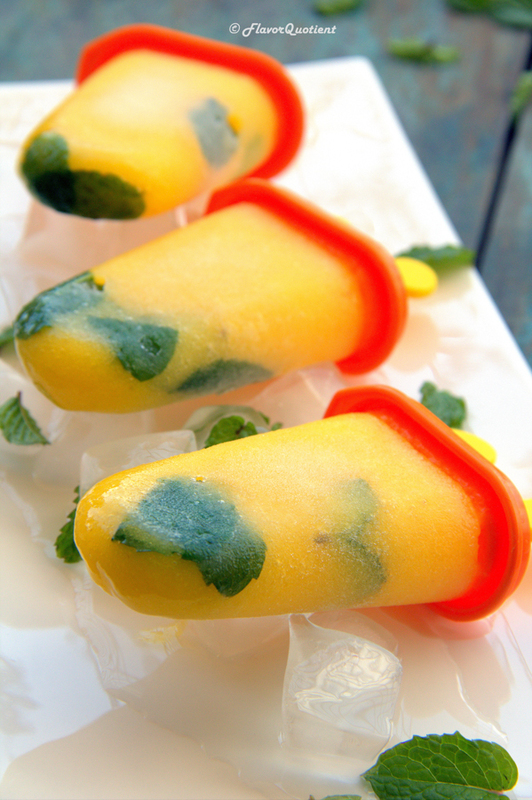 These mango and pineapple Popsicle with a kick of refreshing mint is the ultimate summer treat. These will not only be loved by the kids but also by the kid in you! I had already told you in a recent post of mine that summer in India is all about mangoes – raw or ripe! And I am totally nuts about this gem of a fruit! I mean who wouldn’t!! This is such a versatile fruit that you can create wonders with it. From spicy condiments (Sweet and Spicy Mango Chutney) to lip-smacking desserts (Mango Cheesecake), it is a do-it-all ingredient! Mango season is almost over for this year; so I thought of closing the season with this delightful Popsicle just like the way wrap up a satisfying meal with dessert! 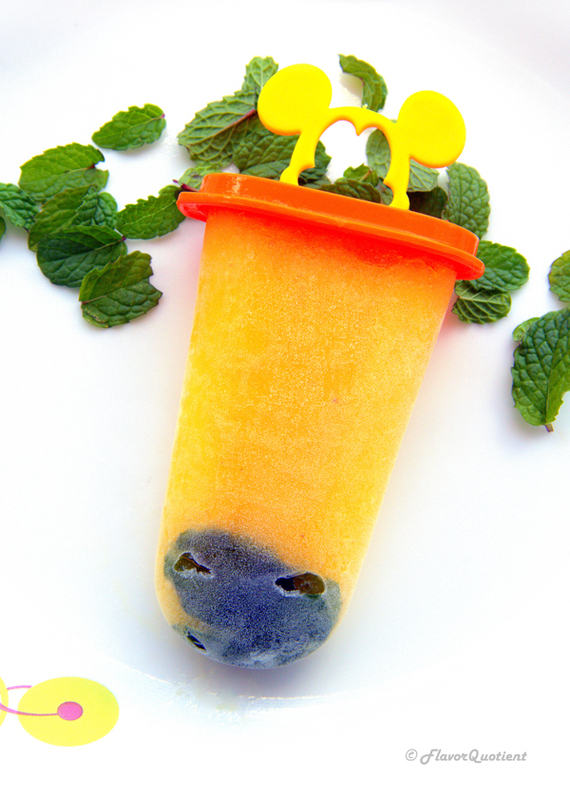 This Popsicle was so easy it make that you will hardly require any recipe for this. Just a quick whiz and you are done. Of course you have to give the freezing time which is the hardest part of all. If you already don’t know that Indian summer is sometimes too hot to handle and these frozen goodness feels like heaven on such days. I loved the kick of mint in this. Mint enhances the cooling effect and you get a refreshed after-effect which is a bonus. Don’t even think twice before making this for your kid’s next party and make sure to keep few extra for the bigger kids! Peel and cut the pineapple into chunks. You can chop them roughly without any precision as everything will go into blender in the end. Peel, deseed and cut the mango into chunks. Put everything into the blender except the mint leaves. Add water one cup at a time – not too much else it will be too watery. Blend everything well until smooth. 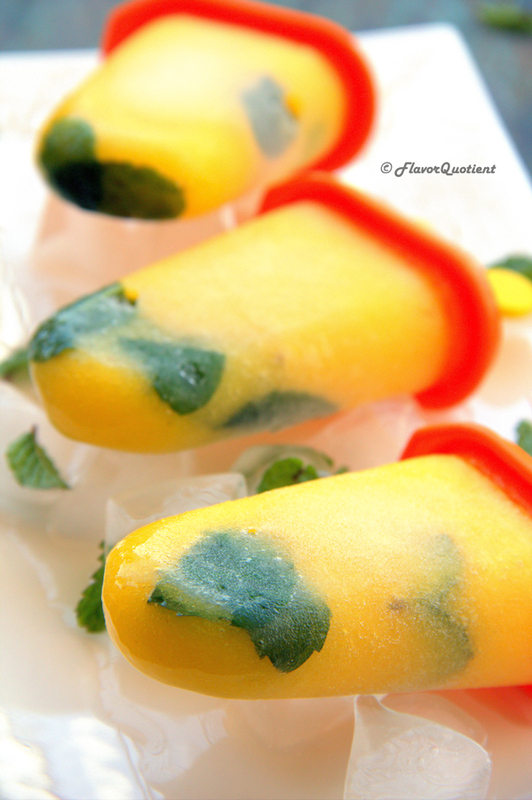 Put 2 to 3 mint leaves into each Popsicle mold. Pour the mango-pineapple smoothie into each mold and freeze them until set. 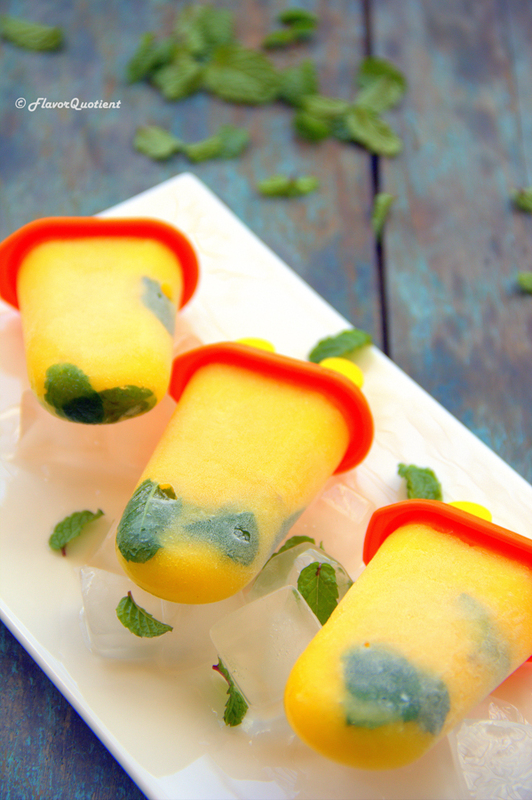 Enjoy the frozen Popsicle in a hot lazy afternoon! These popsicles look so nice, vibrant and refreshing! Lovely share, Priyanka!